SUNY is putting effort into using Open Educational Resources (OER) to help make educational resources more affordable and accessible for students. OERs also give faculty the opportunity to tailor and customize their materials to their course needs. In June 2016, SUNY partnered with Lumen Learning which strives to provide access to affordable and adaptable open course materials. 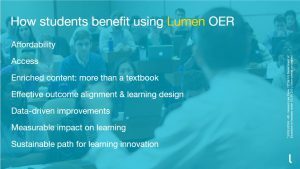 As part of this partnership, Lumen Learning will provide services to SUNY schools including assistance, collaboration, training and technology to help broaden the use of open educational resources (OER). If you have any questions or wish to inquire about Lumen Learning services, please feel free to email oer@stonybrook.edu. You may also consult our OER Research Guide.